Tag line: "The tenant in room 7 is very small, very twisted and very mad"
Eight years before he helmed the bizarre Frankenhooker, Frank Henenlotter made his directorial debut with the even more bizarre Basket Case, which follows the exploits of Duane Bradley (Kevin Van Hentenryck), a small-town yokel who travels to New York City with nothing but a wad of cash in his pocket and a large wicker basket. 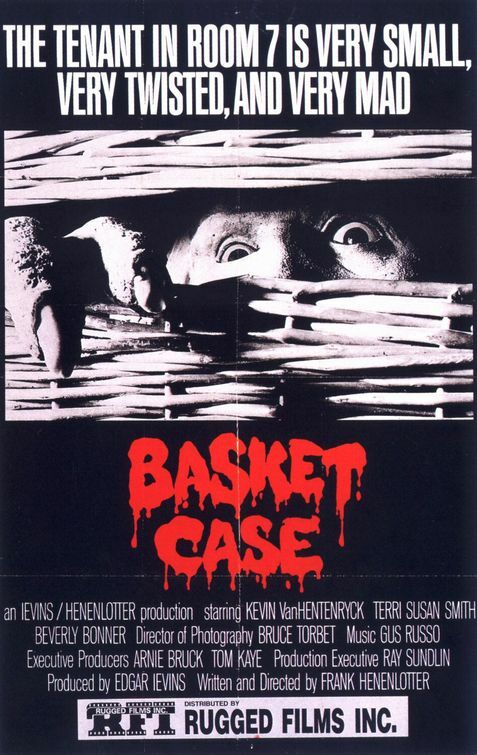 What’s in the basket, you ask? Why, it’s his Siamese twin brother, of course! The problem is, Duane’s twin, who goes by the name Belial, isn’t exactly what you’d call “normal”. In fact, he’s little more than a mute mound of flesh, with a head, two arms, and a nasty disposition. The brothers, who were separated against their will, have come to the big city to take their revenge on the doctors that performed the separation surgery. 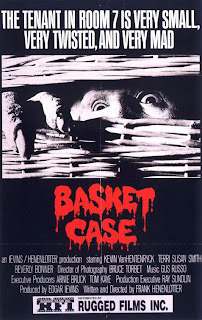 Despite its low budget (according to Henenlotter, the film cost somewhere in the neighborhood of $35,000 to produce), Basket Case accomplishes quite a bit, both in the make-up department (Belial’s victims look convincingly torn to shreds) and, more impressively, the manner in which Belial is brought to life. He isn’t always believable; when Belial attacks, he leaps through the air towards his intended victim, an effect that looks more comical than menacing. Yet Henenlotter and his crew do manage to conjure up some remarkable moments with the little guy. In one scene, Belial flies into a rage when he realizes Duane has left him alone to go on a date with Sharon (Terri Susan Smith), a receptionist he recently met. Aided by stop-motion animation, Belial tears the hotel room apart, destroying a television and tossing a dresser drawer against the wall, and while I wouldn’t go so far as to say the stop-motion was flawless, I have to admit that, for a $35,000 movie, it looked pretty damn good! Even more amazing is how we come to accept this mutated mess as an honest-to-goodness character. There are times we feel sorry for Belial, like in the extended flashback sequence where Duane and Belial’s father (Richard Pierce) forcibly has the two of them separated, then tosses Belial into a trash bag and drops him next to a dumpster. There’s also a touching domestic scene in which the kindly aunt who raised them (Ruth Neuman) reads a book to the brothers, with Belial sitting on her lap as she does so. It’s to Henelotter’s credit that he makes us fear this globular mass, while at the same time ensuring we care about it as well. Considering the budget he had to work with, pulling off just one of these would have been impressive, but pulling both off? That’s nothing short of a miracle.